Stick Man lives in the family tree. With his Stick Lady Love and their stick children three. We're big fans of Julia Donaldson in this house and we'd be hard pushed to pick a favourite out of so many fabulous stories. 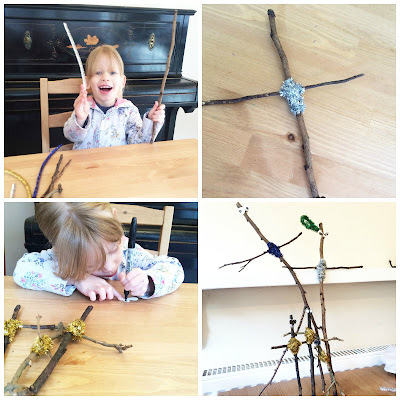 At the moment, after the release of the Stick Man film on the BBC at Christmas, we're particularly keen on Stick Man, so after a winter walk in the woods, decided to make our own. He was a lovely addition to our home, but after a while started to feel a tad lonely and so we introduced a Stick Lady Love and his stick children three. They were so simple to make, using some pipe cleaners (we used a rather snazzy glittery pack left over from Christmas), some card and some sticky tape. The more twisty the stick the better, because that's when you get crazy dance poses which toddlers find hilarious. We have been meaning to do the Stick Man trail at Wendover Woods for a while now. They have an activity pack which you can follow through the woods to a giant Gruffalo sculpture at the end. I know it'll be a fun activity for Lily and just need to get myself organised for a visit. Maybe then we'll find some more family members for our Stick Man family tree. What is your favourite Julia Donaldson story? Have you got any crafts to share? Pop a link in the comments and I'd love to take a look! Ooh, fantastic! I love your stick men. Its lovely to bring a book to life. So cute and a good way of portraying a family too. Another idea to pinch immediately!